When I started looking into portable infrared grills i was surprised that there were several options to choose from. All of the grills below feature the classic infrared combination of extremely high temperatures with minimal flareups. Do not let the small size of these grills fool you. Because they grill at such high heat you are able to grill multiple batches of food in the same time that it would take to finish a single batch on a traditional gas grill. If you have been frustrated in the searing ability of traditional table top grills like the Weber Qs then be prepared to be impressed with what the powerhouses below can deliver. As always, remember that grilling with infrared radiation is different than grilling with a regular gas grill. You will need to adjust your grilling times and preparation methods to adjust to the high heat you will be using. The Grill2Go X200 from CharBroil is a small powerhouse that you can carry along for grilling on the go. The TRU Infrared system operates with at least 65% IR heating and is among the best infrared grill designs available. 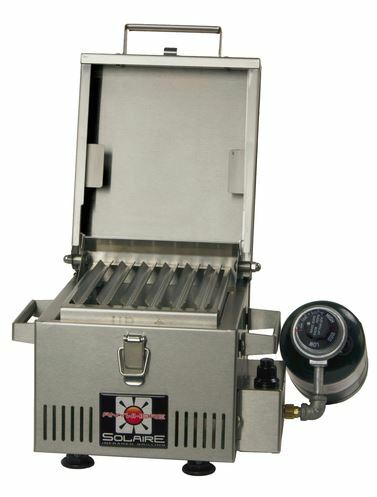 This is the most affordable of all of the transportable IR grills. 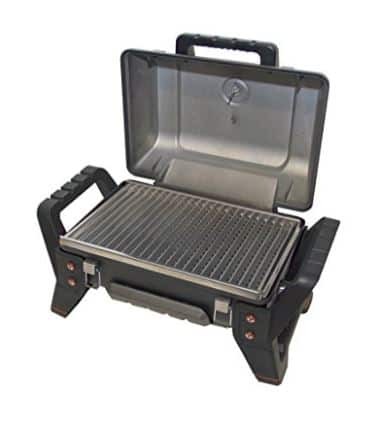 The construction of this grill is heavy duty and has some nice lid latches to keep it closed while moving. Warranty: 5 years on grill body and burner tube. One year on all other components. One thing that annoys me about that CharBroil video is that it is pretty obvious that the grill is never actually turned on…they just stuck a bunch of grilled food on the grate. Here is a video that shows the beauty of the TRU Infrared system in action. High heat grilling of burgers with NO flareups. This is why you want an infrared cooking system. In my opinion the CharBroil TRU Infrared grill is the best value of all of the portable options. Solaire grills come with ceramic infrared burners that heat up fast and enable serious high heat grilling. These premium high end grills are made in the USA with stainless steel construction and limited lifetime warranties. Solaire offers several different versions of their grill but the most popular is the Solaire Anywhere! Here is a great video that walks you through the details on the Solaire Anywhere. Solaire realized that the cost of the Anywhere! grill was too steep for many customers so they did a slight redesign named the Everywhere that has the same core features as the Anywhere but uses less stainless steel. The Everywhere has a lower profile lid than the Anywhere and is made from 24 gauge stainless steel instead of 20 gauge. The redesign allowed Solaire to drop five pounds of steel from the grill and lower the MSRP significantly. 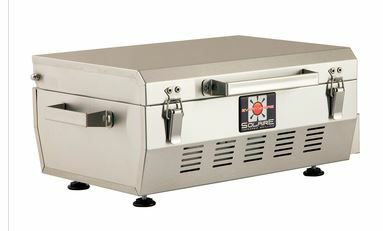 If you want a seriously small IR grill then Solaire also offers a mini infrared cooker that weighs in at less than nine pounds and has 48 square inches of grilling space. If you want an infrared grill to use on your boat then Magma offers some wonderful grills specifically designed for the task. Magma offers two versions of their grills. The base model is the Newport and the slightly larger version is the Catalina. Here is a look at the Catalina. The marine grade features include the corrosion resistant construction, mounting accessories, burners designed to resist blowing out in high winds and easy open/close lids with latches. Like the Solaire products, Magma grills are entirely made in the USA. I am including the TEC grills for sake of completeness, not because I recommend them. TEC pioneered infrared grilling in the 1980s and is a leading manufacturer of premium IR grills. TEC grills utilize a glass panel to distribute infrared energy and get the grill seriously hot (800-900F) in just a few minutes. It takes a while to learn how to use a grill that cooks at these temperatures so expect to have a learning curve. TEC has two infrared models that are portable, the smaller Cherokee and the larger G Sport. Here is a look at the G Sport. TEC grills are made in the USA and their table top grills are certified for use on any surface, including wood. My biggest issue with the TEC grills is the cost. The G Sport costs over $2,000 while the Cherokee is just under $1,000. I love to barbecue but am not about to drop that kind of cash on a grill to take camping.